Be Ready for Winter Weather With These Car Maintenance Tips! Learn how to get your car ready for winter with these tips! The holiday season is here, and winter has come along with it. From rain, snow, sleet, and ice, there are lots of winter weather hazards to be wary of especially when on the road. That’s why it’s important to be ready for the winter ahead. 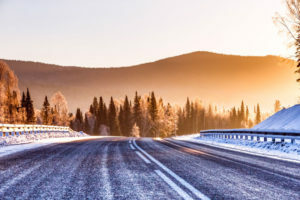 Check out these tips to help keep your car in great shape all winter long. With slippery roads, it’s more important than ever to ensure that your tires are in the best shape possible. Before the winter weather sets in for the season, check your tires to ensure that the tread provides enough traction to keep you safe. Conduct a penny test where you put a penny in the groove of the tire. If you can see Abe Lincoln’s head, then the tire tread is worn, and you likely need new tires. It’s important that your vehicle is working properly. Have your routine maintenance done before the winter months settle in. That way you can fix any issues before any winter storms. Additionally, check to see that the heater and window defrosters are fully functioning, your headlights are in working condition, and that your windshield wipers are ready to go. Keep an Emergency Kit on Hand. You never know when disaster may strike. When it comes to winter weather, it’s important that you’re well prepared. Keep an emergency kit in your car full of extra water, non-perishable food, flashlights, blankets, a first aid kit, snow chains, flares, and anything else you think that you may need in the event of a roadside disaster. Get your car ready for winter so that you have all the tools that you need to handle winter roadside hazards. Get added protection this winter with the right auto insurance. Contact the professionals at Robert J. Los Insurance Agency to find you the right insurance plan. Located in Hamburg, New York, we serve all your personal and commercial insurance needs.